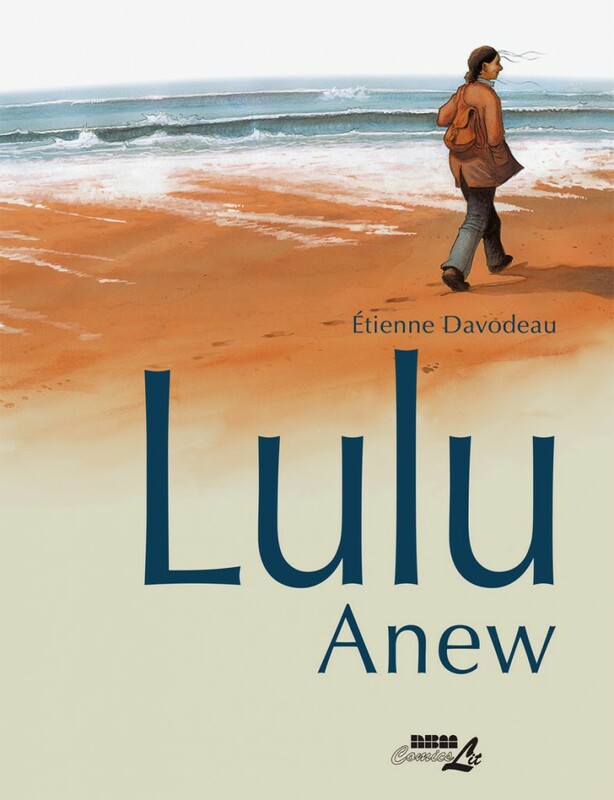 Lulu Anew is a graphic novel by Etienne Davodeau, who I know from his earlier book The Initiates, in which he and a winemaker "traded jobs" for a while. (Davodeau actually helped to made wine, but the winemaker only read comics; he didn't make them.) This was originally published as two separate albums in France -- there's a clear break right in the middle of this book -- but it's been put together for an American audience that likes heftier volumes that come all the way to the end of a story. It's a heavily narrated book, told by Lulu's friends as they piece together her story one long evening after the main events of the book -- and that framing sequence obviously adds tension and drama to what otherwise is a fairly low-key story about one woman's walkabout. Lulu, again, is middle-aged, not lovely, and not particularly appreciated. Her husband is a lout, her twin elementary-school sons are more than a handful each, and her teen daughter not terribly helpful. A job interview in the next city over has just gone badly -- so she decides, on the spur of the moment, to just not go home that night to the unappreciative husband grumping at her on the phone. She stays over at a hotel in that city, where she meets a traveling saleswoman -- the two have a long, wine-filled dinner, and Lulu complains about her life in a way she hasn't for years, or possibly ever. So she doesn't go home again the next morning -- she's not ready to drop back into her old life, full of other people's needs and demands. Instead, she finds herself in a city on the coast, watching the ocean and just being there. She meets a man around her age, Charles, and the two immediately fall into an affair, aided by Charles's two protective brothers. Meanwhile, her hotheaded husband is imposing on the family friends back at home -- he's the typical fictional husband, incapable of doing anything for himself or the family and prone to destroy anything in his way out of mere pique. A friend is sent to the coast city to find and bring back Lulu -- he does one but not the second. Then the daughter comes, with similar results. Lulu does eventually get back home. And the ominous hints from the frame story finally come into focus, in a way that I'm afraid is too manipulative and obvious. But that's a minor flaw. Lulu is a real, complex, fascinating woman -- an average-looking person in a provincial city with an average family, living a life that isn't quite giving her what she needs. Davodeau tells her story at a remove, to give her room to be free and a bit unknowable, the way real people always are. His art tells the story cleanly, and the dialogue has just a hint of dialect in it -- I'm not sure if that's intentional, or an artifact of the translation process making the phrasing just that bit clumsy. 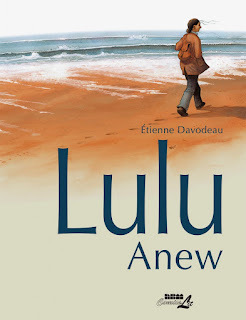 Lulu Anew is a fine story about a complex person that doesn't try to simply her, and succeeds because of that.